The Parental Survival Book:Your How-To’s on raising a healthy new born children. If you are like most expectant parents, you can't wait for your new bundle of joy to arrive. But how do you know what to do once your baby has arrived? You're are aware you want to raise a healthy, and smart child, but how? Relax! The Parental Survival Book has it covered! 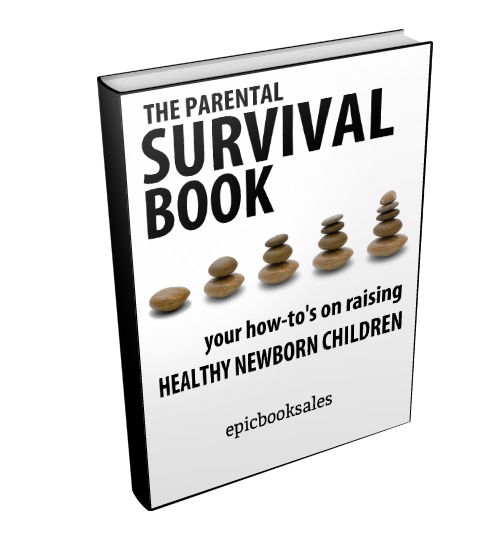 Packed full of information and advice for new or experienced parents, the Survival Book is the guide to parenting mother nature should have included with your new baby. The book allows you to live a life free from worry, knowing that your child will be treated and raised with some of the best methods known among all baby professionals. Written in an easy to follow chronological format, the book offers all the knowledge straight from the first days, to the first years. The book answers countless questions new parents ask themselves, such as: "How do I know if my baby is eating enough?" "How much crying is normal?" and "How do I change a diaper?" Along with these questions, are countless more that will be answered for you to free you of all your worries! *Along with this book, comes special bonus material not available in normal parenting books, which is what makes The Parental Survival Book such a realistic and valuable resource in the development of your child. Example of Bonus content: "Safely Baby-proofing your home"
*It only gets better, the book is available and ready to read on tablets and phones! After you have heard all this? I think you're getting more than your moneys worth. Purchase The Parental Survival Book Today!